NutriFlair Keto Pills Review | Buy or a Scam? Medium Chain Triglyceride (MCT) oil is a favourite of those following the ketogenic diet, as it remains one of the world’s healthiest sources of dietary fat. This man-made oil is derived from coconuts and has been linked with weight loss, a raised metabolic rate, and a reduced waistline. Helpfully for those on the keto diet, these multitalented MCTs can also be converted directly into ketones, helping observant dieters reach and sustain the state of ketosis more effectively. Below we take an in-depth look into NutriFlair Keto Pills, to see whether these MCT-based capsules are as effective as the scientific evidence suggests. Nutriflair Keto Pills are small weight loss capsules that also claim to suppress the appetite and provide a burst of energy. Containing a simple mixture of so-called keto salts and MCT oil, these pills are designed to induce the state of ketosis more quickly. As many readers may know, followers of the ketogenic diet often seek to reach a metabolic state called ketosis, which emerges when the body has insufficient supplies of glucose to use for energy. To counter this, the body will use its fat stores to produce ketones which are then used as an alternative energy source (causing a rapid reduction in fat mass and overall weight). Due to its supposed ability to induce this state more quickly using salts and MCTs, this product can be thought of as an aid to the diet itself. What Are The Side Effects Of NutriFlair Keto Pills? Nutriflair Keto Pills are not thought to carry a high risk of side effects, and we haven’t spotted any customer reviews complaining of adverse effects. However, some customers may experience some rare adverse effects as a result of consuming MCT oil, which may include nausea, diarrhoea, vomiting, irritability, and more. How Much Does NutriFlair Keto Pills Cost? On Amazon, a 60-capsule pack of Nutriflair Keto Pills (a one-month supply) costs $19.99. Occasional listings also go up on eBay from time to time, where the same pack often sells for around $16-$17. The ketogenic diet is one of the tougher diet options out there, and it’s nice to see the supplement industry innovating to create some good ways to support struggling dieters. Unfortunately, products like these set their customers up to fail. This product’s main active ingredient is MCT oil, which really does seem to possess all of the intriguing and beneficial properties we described in our introduction. However, the research that shows that MCT oil has all these benefits assumes that customers are consuming large amounts of it, perhaps by substituting it for ordinary cooking oil or butter. Taking a couple of capsules containing less than 1.5g of the stuff just won’t cut it – you can’t expect to reach ketosis by consuming an extra gram of fat, no matter how optimised it is. The ketone salt ingredient is also a dud that is based on a fundamental misunderstanding of how ketosis causes weight loss. So why do customers seem to like this product? We’ve noticed that many seem to describe rather leftfield benefits such as appetite suppression or a burst of energy, and no customers actually mention entering ketosis more easily or experiencing a higher blood-ketone rate on their Ketostix. We honestly think anyone experiencing benefits from a product that is almost certainly useless is just feeling the all-powerful placebo effect. Ketogenic dieters need all the help they can get, but a shortcut like Nutriflair Keto Pills will only set you back. One to avoid! We do not recommend NutriFlair Keto Pills to our readers. Nutriflair Keto Pills claim to help customers lose weight, whilst also suppressing the appetite. Designed to be taken alongside the ketogenic diet, this blend of BHB salts and MCT oil aims to induce the desired state of ketosis, which allows the body to burn fat stores directly for energy. The capsules are suitable for vegans, are gluten and dairy-free, and are non-GMO. Manufactured by NutriFlair, a subsidiary of Finest Vitamins LLC. Nutriflair Keto Pills are manufactured by a company called Nutriflair, which is a subsidiary of Finest Vitamins, LLC (both based in the USA). Nutriflair sell a wide range of supplements, including probiotics, fish oil, colon cleanses, and weight loss pills. For some reason, only some of the company’s products are sold on its official website, with the rest available on Amazon and eBay. Nutriflair can be contacted via the details supplied on its official website. As a dietary supplement, take two (2) capsules once a day. For best results, take 20-30 minutes before a meal with an 8oz glass of water, or as directed by a healthcare professional. What Does NutriFlair Keto Pills Claim To Do? 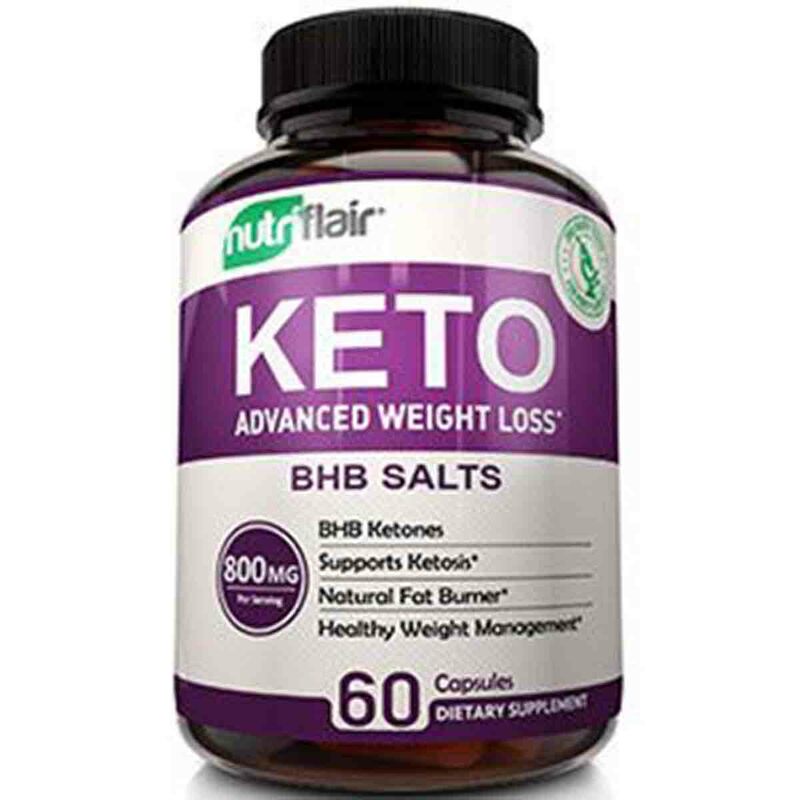 Nutriflair Keto Pills are advertised as weight loss supplements that work well as part of the ketogenic diet. The combination of BHB salts and MCT oil is said to induce a metabolic state called ketosis, which normally emerges as a result of an extremely low-carb diet. As the body runs out of natural stores of glucose, it instead begins to draw on the body’s fat stores as a source of energy, with ketones being released into the bloodstream as a by-product. As this product supposedly helps dieters to reach this state more effectively, it is intended to be broadly used as a weight loss and weight management aid. 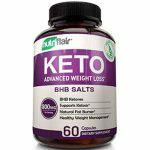 In addition to their main intended effects, the manufacturer also claims that Nutriflair Keto Pills can work as appetite suppressants and energy boosters. Other promised benefits include better brain and memory function, increased endurance, lowered cholesterol, and lower blood sugar levels. Does NutriFlair Keto Pills Work? In a nutshell, this product almost certainly does nothing to induce ketosis, with its two ingredients based on very shaky theoretical foundations. Although MCT oil is thought to help those on the ketogenic diet due to its role as a healthy dietary fat, all evidence showing it to be beneficial for this purpose assumes that people use it as a substitute for the dietary fat they consume for the day. Put simply, this ingredient can only help you if you’re consuming grams and grams of it per day – a tiny teaspoonful packed into a capsule will do roughly the same for ketosis as a capsule packed with cooking oil. The premise behind the other ingredient is even stranger. Some researchers have argued that they can put the body into ketosis by simply feeding people certain salts, which means that the body starts releasing ketones into the bloodstream. And just like that: ketosis! The problem is that none of those researchers has ever checked to see whether the actual weight loss and fat-burning effect still takes place during this oddly-created state of ketosis. If you think about it, inducing ketosis via consuming salts is extremely unlikely to lead to weight loss if a low-carb eating plan is not observed, as the body still has glucose stores to draw from. 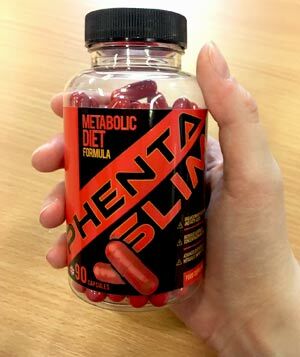 Overall, we would strongly argue that this product does not work as a weight loss aid, and almost certainly will not deliver on the dozens of other promises it makes. What Are The Ingredients of NutriFlair Keto Pills? The ingredients found in NutriFlair Keto Pills are listed below. 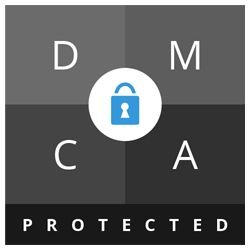 Unfortunately, the manufacturer fails to list ingredient quantities anywhere on the packaging or sales websites, making it impossible for reviewers or customers to work out how effective the formulation is. The sole quantity listed is correct for 2 capsules. Does NutriFlair Keto Pills Have Any Side Effects? This product is highly unlikely to cause side effects, although some customers may experience adverse effects on very rare occasions. Medium Chain Triglycerides (MCTs) are safe for most people, although they can occasionally cause issues such as diarrhoea, nausea, gas, vomiting, irritability or a deficiency in essential fatty acids. Consuming MCTs with food often reduces the chance of side effects. Are There Any Customer Reviews For NutriFlair Keto Pills? Most of the customer reviews posted to Amazon are positive in tone, although no customers have claimed that Nutriflair Keto Pills have actually induced ketosis as promised. Most praise appears to have been directed to the product’s role as an “appetite suppressant” or “energy booster”. Some negative reviews mention feeling cheated by the misleading dosing instructions posted on the main Amazon sales page. I absolutely love this supplement! I had been struggling with my keto diet for awhile now because im always surrounded by carbs. Soon after I started taking this supplement my appetite started to suppress a bit and I no longer feel the urge to consume carbs. I highly recommend this product for anybody that wants to get on the keto diet. Used it for my running yesterday, felt a significant difference in energy when running my 3 miles. head feels a little bit more focused and clear. So far so good, bought this because I was told these ketone pills would be beneficial for what I’m doing. I feel like I have more energy after taking these pills. Overall no complaints so far. Doesn’t the picture speak a 1000 words? 1600mg capsules and you get 60 of them…right? Wrong! It’s a LIE. Does NutriFlair Keto Pills Offer a Money-Back Guarantee? Although NutriFlair claims to offer a full money-back guarantee on the Nutriflair Keto Pills Amazon page, a visit to the company’s official website reveals this not to be true. Customers are able to return any purchase within 30 days but will only receive a refund for unopened products that are in a re-saleable condition. In addition, all customers choosing to return products will have to pay an additional 10% restocking fee (alongside all shipping and handling charges). Where Can I Buy NutriFlair Keto Pills? Nutriflair Keto Pills are available to buy on Amazon and from some independent sellers on eBay. 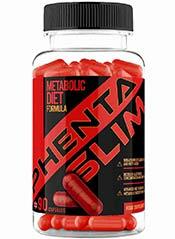 How does NutriFlair Keto Pills compare to Phentaslim? The Diet Pills Watchdog does not recommend NutriFlair Keto Pills.